Act now and save 15% off DUNS file from Dun and Bradstreet online. Use this code to save $99 off with this coupon code from Dun and Bradstreet. 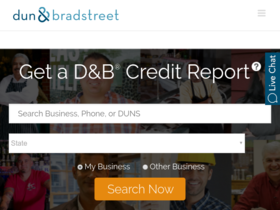 Save when you Purchase Multiple Credit Reports: Buy 5 pay for 4 OR Buy 10 pay for 7 with this special Dun & Bradstreet coupon code. Save 10% off business information reports with this coupon code from Dun and Bradstreet. Check out Dun and Bradstreet online for their latest special offers.